This is going to be an updated post over the course of healing. 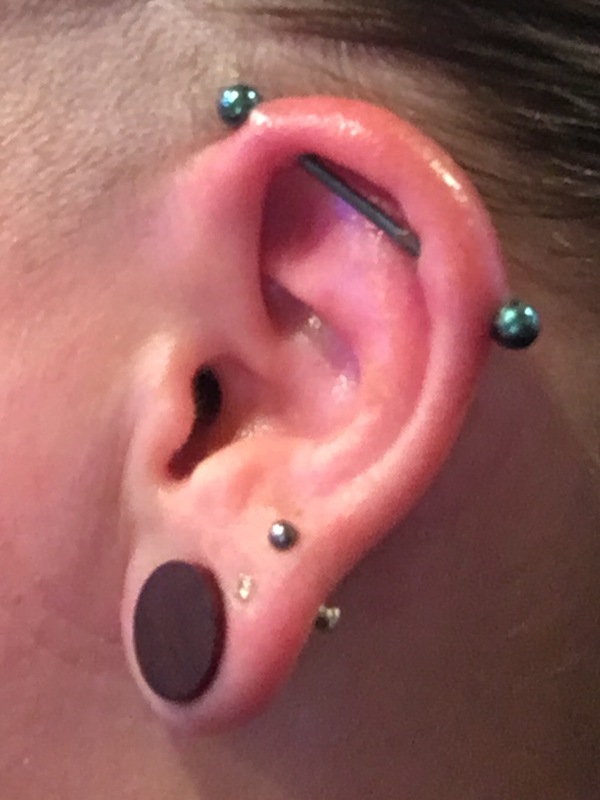 I have wanted this piercing for years, and it is a reward to myself for losing the first 10lbs after gaining 40lbs on Cipralex. I have also been on a mission this year to find myself. As a teen I wanted to be a tattoo artist and piercer, and collected many piercings, but just the one tattoo. When Kanga was 2, I got my second tattoo, a pink ink day tattoo of a butterfly ribbon. I’ll post my collection later. 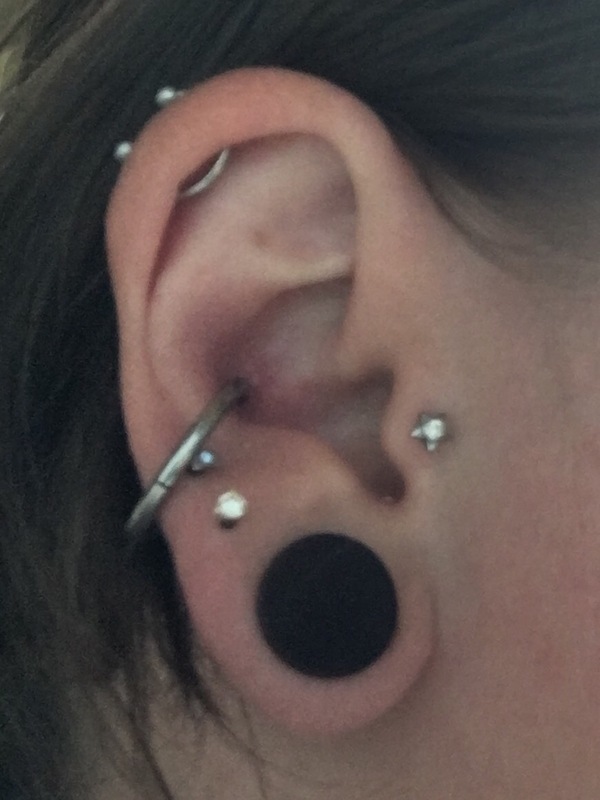 This past year in February I got my conch pierced at 2mm/12ga, an arrow on my forearm, and circular galifreyan tattoo of the kids names on my inner bicep. In November I got a poppy semicolon. I’ve put my lip ring back in, taken it out, put it back in (and gotten a proper taper to do it with). 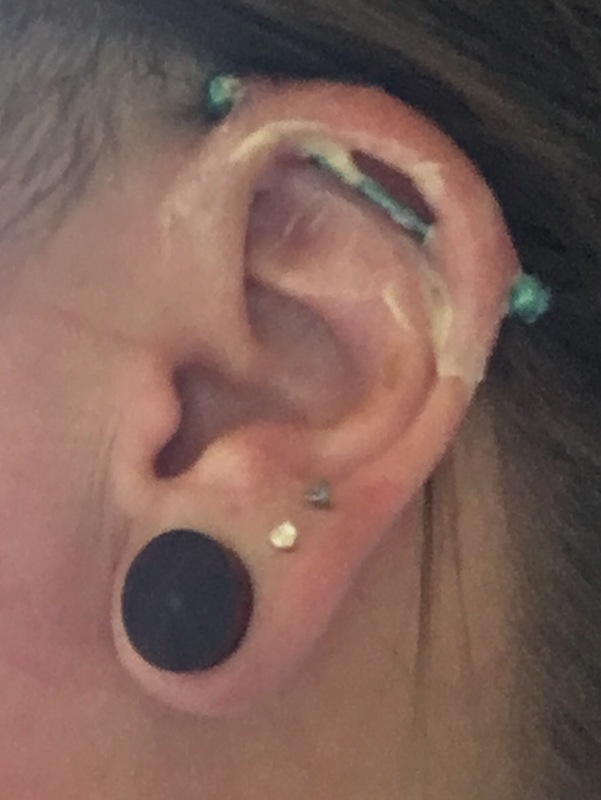 I also opened my lobes back up to 12mm/1/2″. I’d let them shrink down for my wedding, and 13 years later still missed them. May 7, 2017: cleaning sucked last night, but I managed to not bump it once last night while sleeping. This morning a salt water soak, and a qtip gunk removal after my shower. Still tender, but swelling is minimal and less overall ouch. Piercing itself was done slowly so that he could get it perfect the first time. 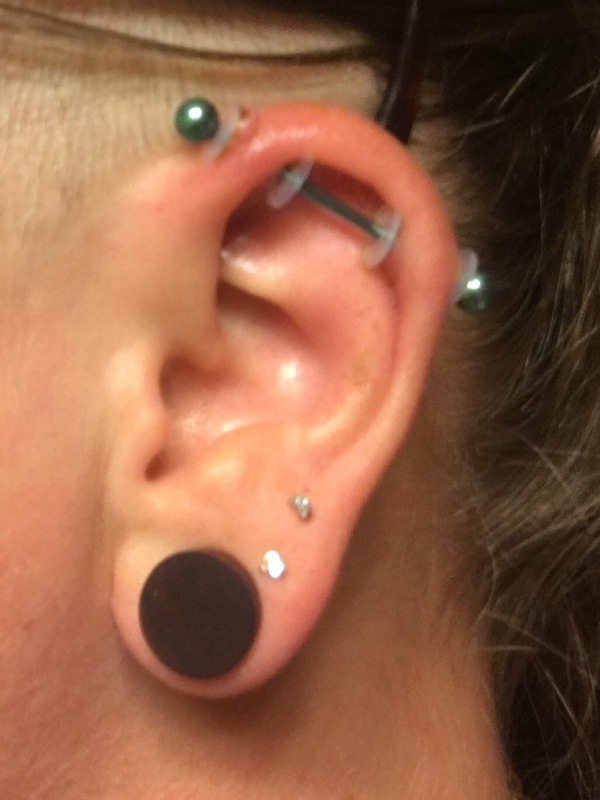 I felt every bit of the needle going through the skin, cartilage pop, and then out the other side, skin pop. 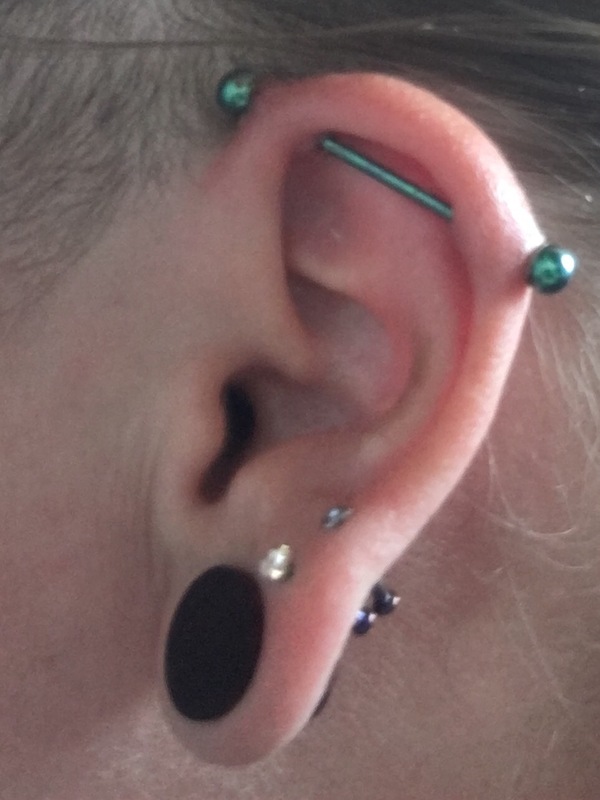 That was different from my other piercings as the piercer would line up and then pop it through. Like I said though, he lined it up perfectly, so worth it. 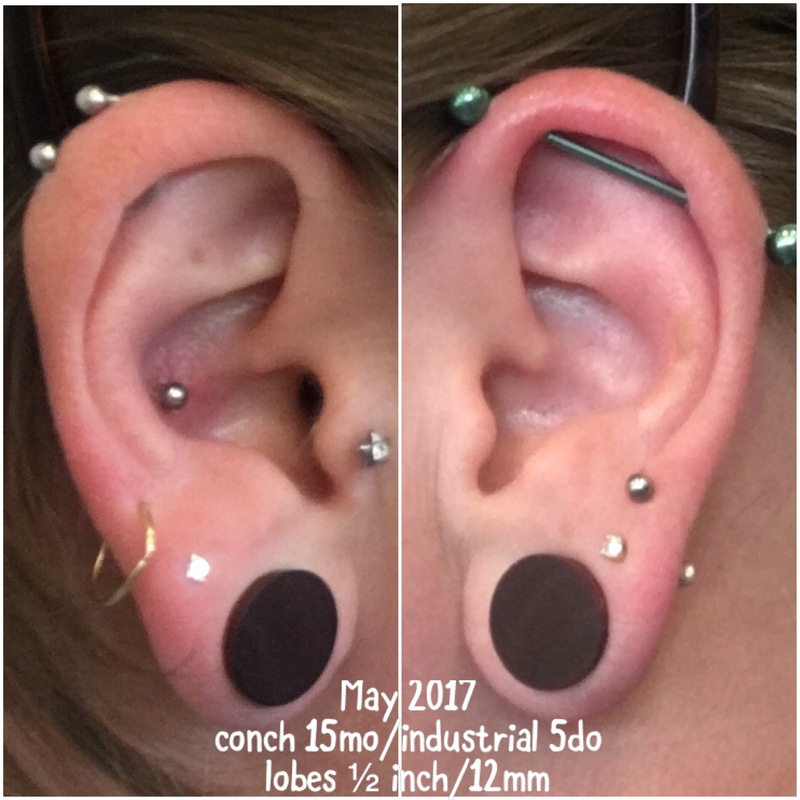 Out of 10, maybe a 5 with conch being a 3. Note on bar: Chris Knight of Black Sheep put in the proper length to avoid it getting caught, because ears flex. 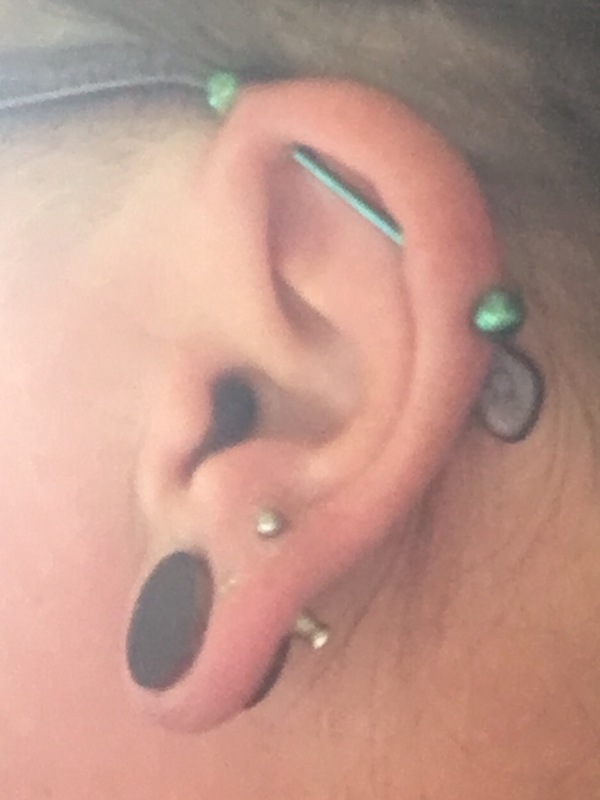 He also doesn’t do two bars because piercings settle and they may not fit the single bar again after healing. 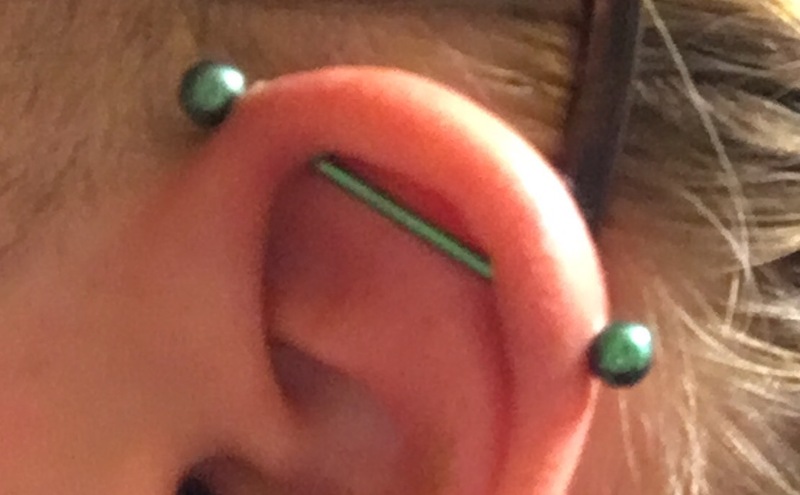 I had choice of jewelry, and asked what the material of the green one was and he said titanium. As I prefer titanium, here it is! 6d: helix is fine, barely sore at all. 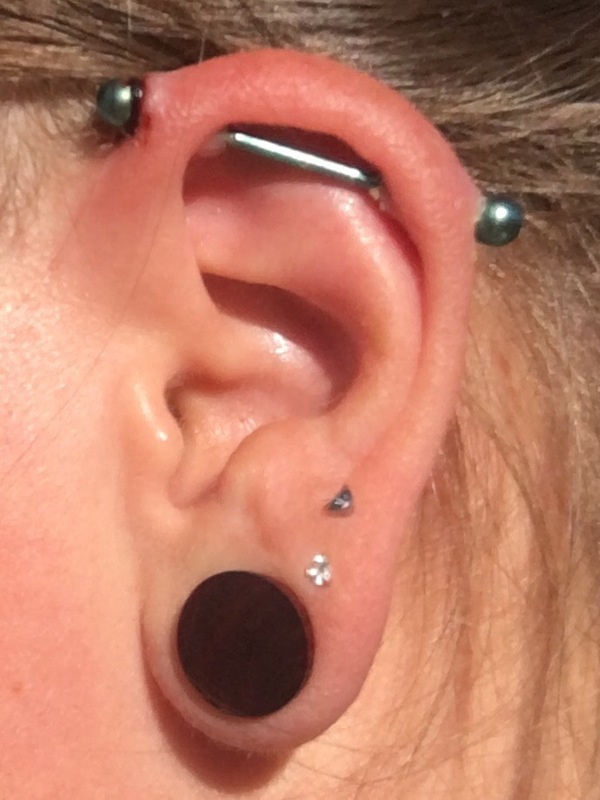 Forward helix, yeah no. You can see that flaming red sore mess. Not hot, but extremely sensitive. 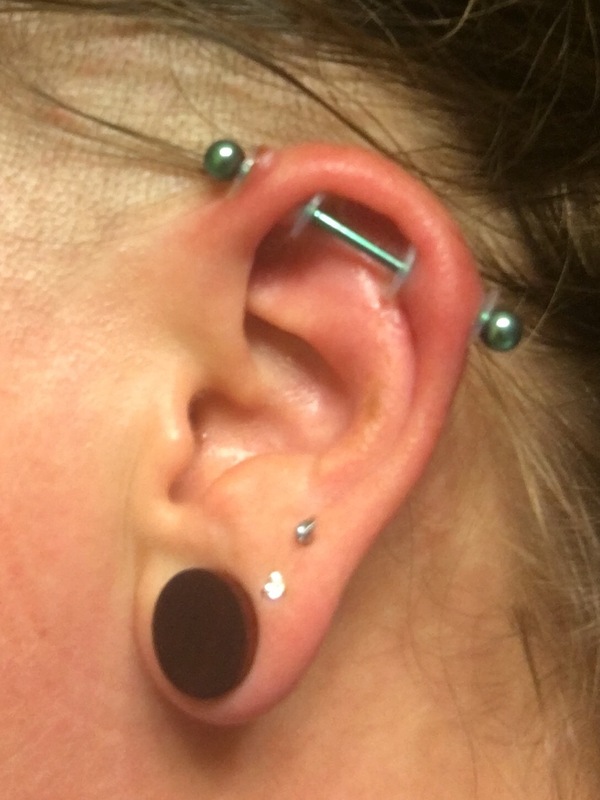 1w: pain in forward helix worse yet. Redness still worse. 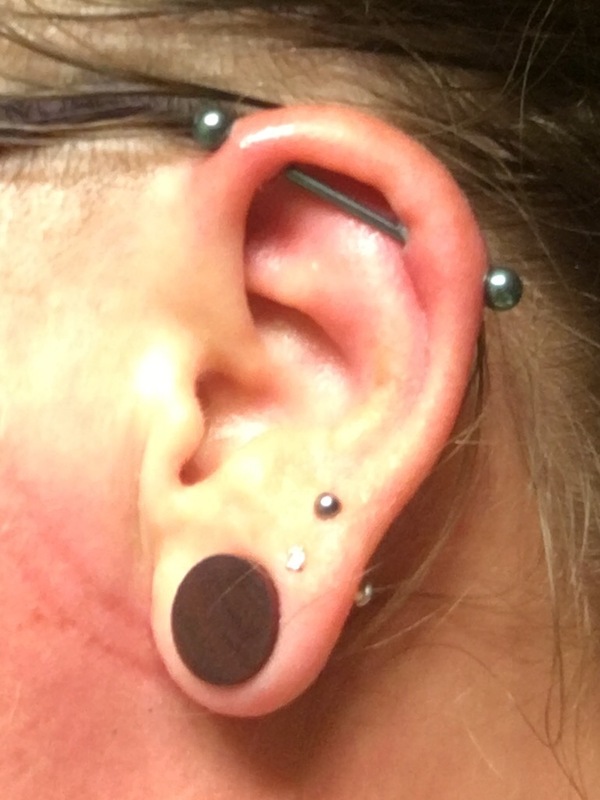 I shaved the area around the forward helix because IDGAF and it won’t get caught. I also sterilized my glasses arm, and am not wearing my glasses tomorrow. 1w+1d: goo is releasing. Doesn’t look infected, just lymph, but pain is better, and no glasses seems to have helped. I also got some Bactine yesterday which has lidocaine in it as well as an antiseptic, so I’ve been spraying that on it a couple times a day in addition to the sea salt soaks. Most of my jewelry comes from PainfulPleasures.com. Buying jewelry online is not optimal, because you only exacerbate the problem of not being able to buy quality jewelry at local shops. To get your shop to carry more selection, you have to support the shop. You should also be looking to get one of three main metals. Niobium which is completely hypoallergenic, but has some downfalls as well. 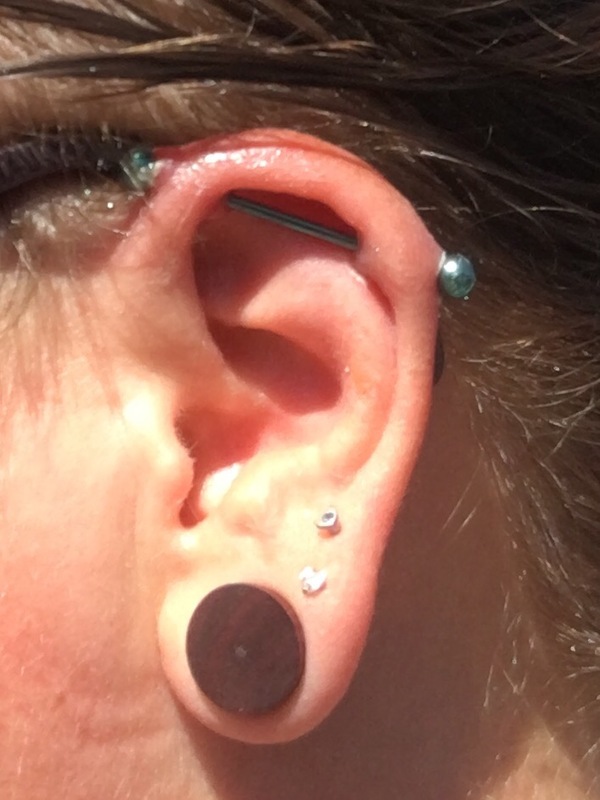 Look up Pangea Piercing for lots more on quality jewelry and why it matters. 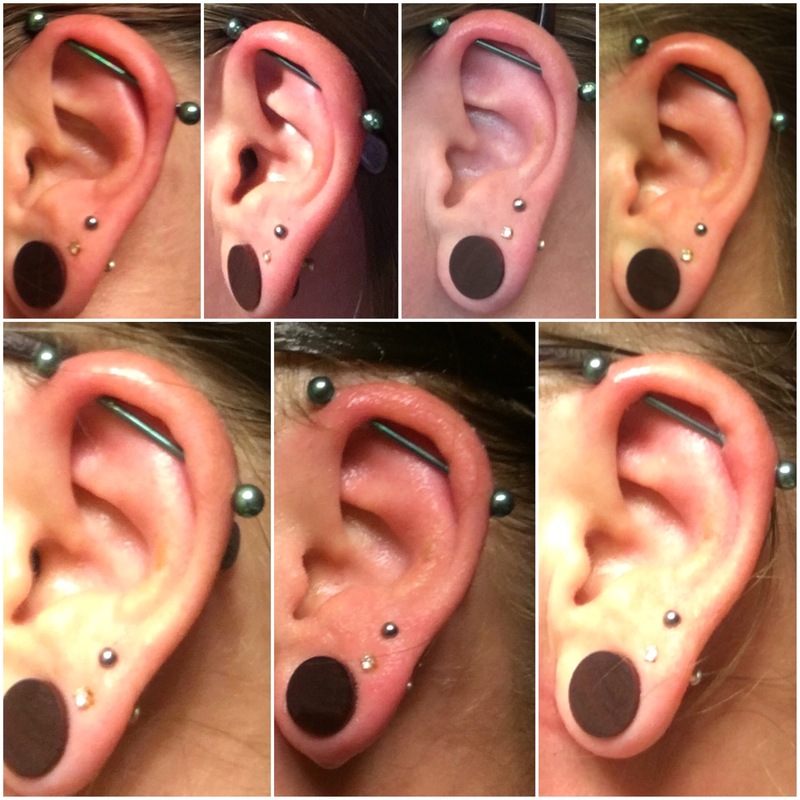 This entry was posted in Body Modification, Uncategorized and tagged industrial, industrial piercing, piercing, scaffold, scaffold piercing, titanium, titanium jewelry. Bookmark the permalink.